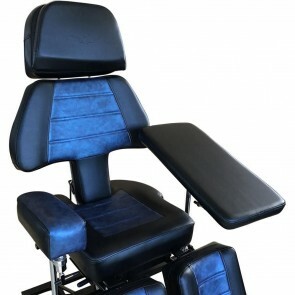 The Professional Client Chair is a unique product within the tattoo world and on our website. This customer chair is an inhouse production from Tattooland Supplies, which is offered in many colours and prints. The Professional chair can turn 360 degrees from left to right and the backrest can be placed completely flat down. Adjust the seating, armsupport, legsupport, back, headpeace and more for the perfect positioning of the client and an optimal working area for the artist. The result is comfort for both artist and client. Combine the Professional client chair with the Armrest Pro, which you can attach easily to the chair. And the Professional stools for comfortable seating for the artist during the sessions. The stools are available in the same colours as the Professional chairs for a good match in your studio. They are adjustable to the perfect height to combine with the client chair.